When the Vivo V7+ was announced, I was one of those who griped about its display and processor vis-a-vis its price. But after using the device for almost a month, I realized that its specs does not equal its value. Here is my full review of the Vivo V7+. Priced at PHP17,990, the Vivo V7+ packs a fair amount of features for mid-range smartphone. 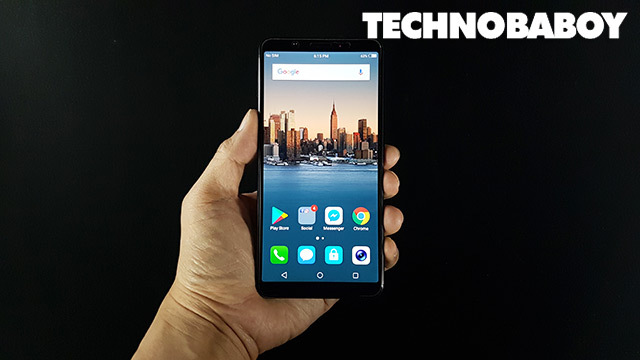 The handset that managed over 5,000 pre-orders in just a week may have its shortcomings, but it does make up for it in spades with its strengths. We’ll try to cover most of it in the review. Before we start, here’s the full spec sheet of the Vivo V7+. The Vivo V7+’s retail package includes a travel charger, a microUSB cable, a set of earphones, and a TPU case. As with most China phones, it’s always a bonus when they include a case with the phone. It fits perfectly well, plus it beats additional spending for one. The phone also comes with a pre-installed screen protector (another bonus), but it overlaps the screen on my review unit. The Vivo V7+ is, by all accounts, beautifully designed. It looks good with a sleek profile and an elongated rectangular body. It’s slim and, thanks to its tiny bezels, has good size relative to its 5.99-inch 18:9 display. The phone itself is made of plastic and glass. The back panel looks and feels like metal (good job on this one), but it’s actually not. It’s not a set back by any means, but it wouldn’t hurt to make it metal. Despite that, the phone still feels great in the hand thanks to its solid build quality. On the front, the Vivo V7+ is mostly all display, thanks to its tiny bezels. The front camera is found on the left side of the earpiece, with the Moonlight Glow LED flash / fill light on its right. You’ll notice here that the 2.5D Corning Gorilla Glass 3 screen is slightly raised. It meets a raised plastic that frames the screen, instead of seamlessly melding with the frame itself. It’s not visually noticeable but you can feel it if you run your fingers along its edges. At the back is where we’ll find the 16MP rear camera, the LED flash, the fingerprint scanner, and some branding. It looks clean, and I like how the silver Vivo logo and the silver antenna lines give it a handsome accent. It would have been perfect if not for the camera that is raised a few millimeters from the panel. Not only can the exposed lens be susceptible to damage, but its edges feel sharp when you run your finger on it. On the left side you have the SIM tray which can hold two SIM cards. It has a separate slot for the microSD card. On the right are the volume rocker and power button. The bottom is where you’ll find the headphone jack, microUSB port, and a single speaker grill. The Vivo V7+ comes with a 5.99-inch HD display with an 18:9 aspect ratio. Yes, you read that right — the display is only in HD with a 1440 x 720 resolution and a pixel density of 269 ppi. While I had hoped for a full HD, the screen — in all honesty — is not that bad. Its bright with good color rendition and reasonable sharpness. When watching videos or playing games, I hardly noticed the difference in quality at all. Its when you start zooming in while viewing photos is when you’d notice it. The handset runs on Vivo’s Funtouch OS v3.2. It is a heavily customized version of Android 7.1.2 Nougat, inspired by iOS. The UI is surprisingly fast and fluid. It is butter smooth with responsive and snappy animations without looking hurried. The speed and fluidity is, no doubt, helped by the HD display — because the phone doesn’t have to struggle as much to push graphics to a large resolution. The Vivo V7+ is powered by the new Snapdragon 450 processor. It comes with an Adreno 506 graphics unit and 4GB of RAM. At first I thought the 450 was an entry level SoC. But according to Qualcomm, the 450 is a mid-range processor. This could have been marketing on their part, but it is the first processor in its tier to use 14nm FinFET process. It is designed to deliver significant improvements in performance and battery life over its predecessor. Still, I would have preferred a Snapdragon 625 or higher under there because it’s always nice to have that extra power if or when I need it. That being said, performance of the Vivo V7+ was rather good. It is fast and responsive with little lag. Navigating the device was a pleasant experience. Games like Transformers: Forged to Fight played well. It did stutter a bit while browsing heavy websites, but otherwise everything was smooth. Again, the combination of the processor with the HD screen helped. In AnTuTu Benchmark, the V7+ got a score of 56,499 points. In comparison, the Huawei Nova 2i got an average score of 64,000 points. But if you broke down the scores, the phones’ performances are not that far apart. In the 3D part of the test for example, both scored around 10,000 points which, according to AnTuTu, is equivalent to mid-level gaming performance. It’s the same for the RAM test category. The difference came under the UX and CPU part of the test, which the Nova 2i got a clear advantage. Part of this could be attributed to the latter’s higher processor clock speed. I was pleasantly surprised when I found out that the Vivo V7+ has face unlock. It’s not as cumbersome to use compared to, say, an iris scanner. Performance was fast and sometimes you barely notice it working. It unlocks the phone once you pick it up. This is one area where the Vivo V7+ shines. The phone comes with an AK4376A Hi-Fi audio chip. The word Hi-Fi appears at the top of the screen whenever you plug in a wired headset. When this is on, listening to music and watching videos become a pleasant experience. Audio is clear and appear to have a wider dynamic range. To maximize the feature, you would need a good quality headset and high quality music files. Call quality of the Vivo V7+ is good. Calls to and from the device was clear. I didn’t notice any problems on this aspect of the phone during testing. One of the highlights if the Vivo V7+ is its cameras. The front camera uses a 24MP sensor with a f/2.0 autofocus lens, and a Moonlight Glow LED flash. It has Beauty mode and group selfie mode, among others. The rear camera uses a 16MP sensor with a f/2.0 lens, PDAF, and a LED flash. The front camera on the Vivo V7+ can produce high quality selfies with good colors and fine details compared to other devices in the mid-range bracket. The Moonlight Glow fill light is especially useful when extra lighting is needed. The rear camera also does fairly well in good lighting conditions. The phone focuses fast, allowing you to take pictures faster so you don’t miss a moment. Images have good color, but at times look soft. In low light conditions, sharpness and details are not as pronounced, and noise creeps in. Despite that, most photos that come out are still quite usable. In a nutshell, if most of your photos (selfies or not) end up in social media, then you’re all good with what the Vivo V7+ offers. It has more than enough juice for that. Note: Images has been resized in Photoshop with no alterations. The V7+ comes with a 3,225mAh battery. The capacity is what passes as normal for smartphones nowadays. In real world usage, that translates to a day up to a day and half with mid to heavy usage that includes some social media, listening to music, browsing, and watching YouTube videos. The Vivo V7+ is, by all accounts, a very capable device. Its a beautiful phone, but it comes with a few setbacks — the display, the processor, and the price. But as previously stated, the handset does have a number of redeeming qualities that make up for it — music/audio performance, selfie camera, and the battery life. Competition is tight at the mid-range market. And at PHP17,990, it’s going to be hard pressed to compete with cheaper offerings from Huawei and OPPO. Choosing the Vivo V7+ over the others will ultimately depend on the features that matter to you the most. The Vivo V7+ is now available in stores nationwide. It has a retail price of PHP17,990, and comes in Champagne Gold and Matte Black. For more geek-centric news and reviews, please follow us on Facebook (facebook.com/TechnoBaboy), YouTube (TechnoBryan), Twitter (@technobaboy), Instagram (technobryan), and Google+ (technobryan). We’ll do our best to keep you up-to-date.